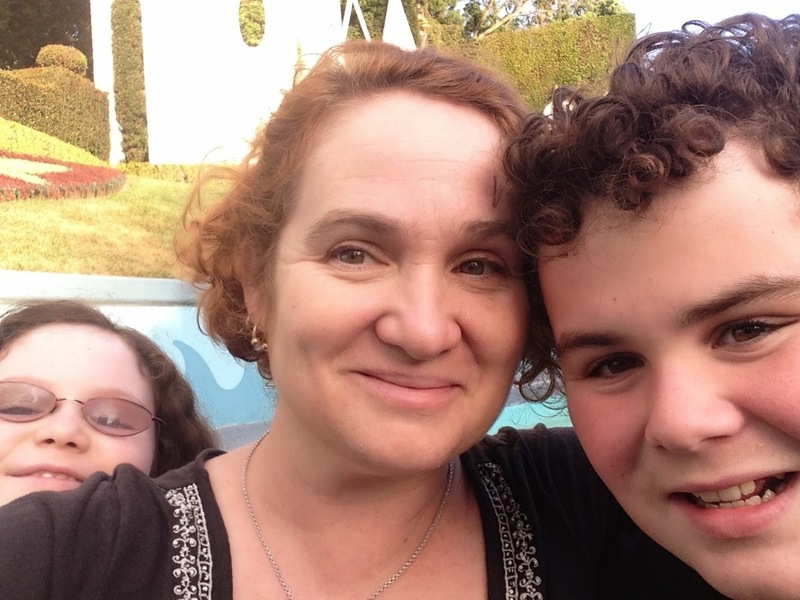 Have you or, if you're a parent, have your kids ever been to a Disney theme park? If so, does it hold you or yours in thrall the way it holds my teenage son? Leo has been asking to go to Disneyland nearly every day since his last visit 20 months ago, because the Land of Mouse is his very favorite place, largely thanks to its disability accommodations. But after that Happiest Place on Earth changed that disability pass system last year, I balked at going. One of Leo's personal philosophies is Anything Different Is Bad. Really bad. So a different Disneyland experience would be Really Bad. Plus I heard nightmare accounts of vacations gone sour, endless lines, folks having meltdowns, and more (DRtC*). I didn't think Leo deserved to have a rotten experience at a place he considered his personal Wonderland. Best to stay away. And I thought, hey, maybe it could work. Maybe the key to avoiding bumps was not adapting to the new system itself, but going during a low attendance day. So I checked the IsItPacked.com Disneyland Crowd Forecast calendar for a low attendance day near Leo's birthday. And it said that the day after Veterans Day, which was a Wednesday this year, would be a mellow day. I think Leo had a great time, such a happy time, because we planned carefully. We stayed at the on-site hotel for just one night, so we could have a relatively relaxing drive on the way down, and a relatively relaxing pre-Disneyland afternoon and evening at the hotel pool, at the hotel restaurant, and wandering around the adjacent Downtown Disney shops and restaurants. Leo likes all of those places. Staying at the hotel allows for other conveniences: we could leave our car at the hotel overnight, and pick it up right after we left the park -- no waiting in endless post-closing lines for the parking lot shuttles. We could leave our luggage at the hotel as a courtesy the next day, even after we'd checked out. 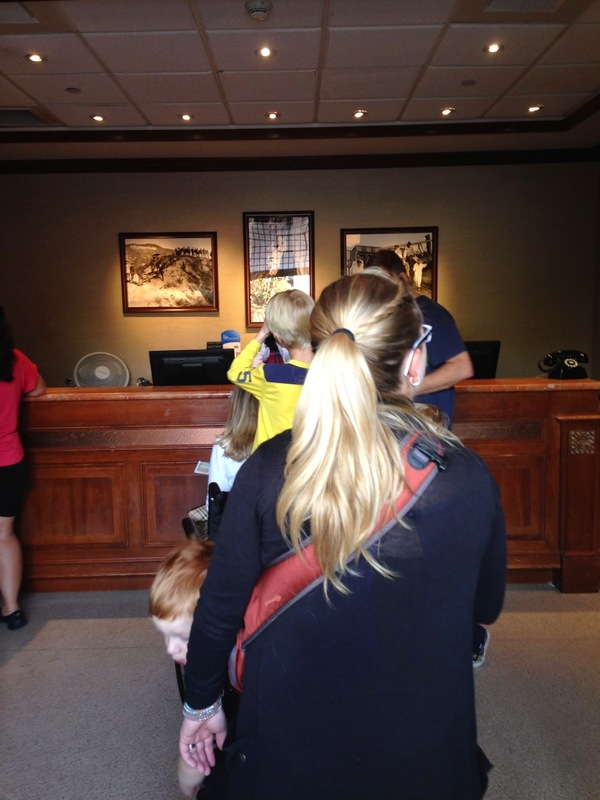 We could buy our tickets for the park as we checked in to the hotel. We could get Happy Birthday pins for Leo and Mali at the same time, because we were there for both of their birthdays. Leo's Happy Birthday pin meant that everyone, everywhere -- hotel, park, restaurant -- wished him Happy Birthday by name (Mali, who is slowly starting to care what other people think, declined to wear hers). Leo thought constant happy birthday greetings were great. The hotel pianist even changed his tune to Happy Birthday when Leo walked by. 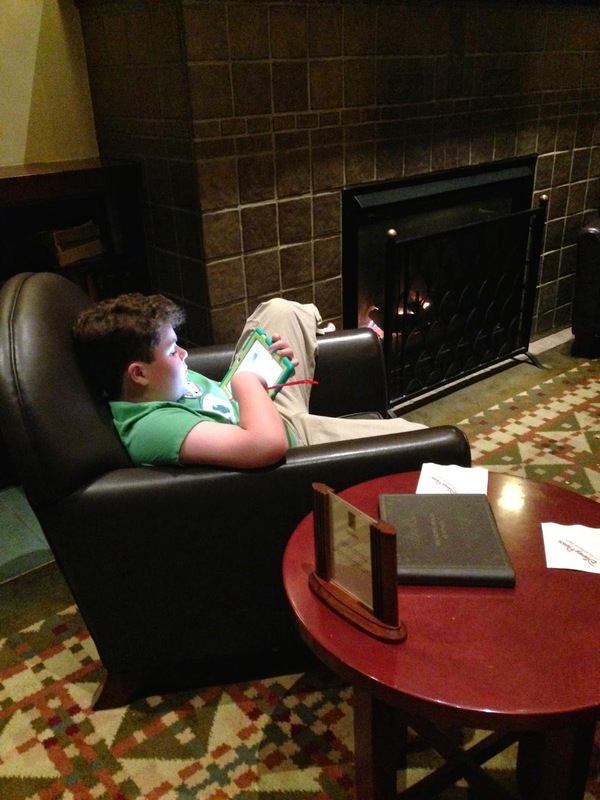 (We were en route to the Lounge, where Leo could chill while I had a mai tai, and Mali went and made Lego racers with a local friend at the Lego shop.) I thought the birthday awareness and recognition was a lovely touch. Another, really important part of staying at one of the three Disney hotels is that you have access to Magic Hour, which means one park per day (it alternates) opens up one hour early for hotel guests only. Even better? They actually open up the gates 15 minutes before Magic Hour. 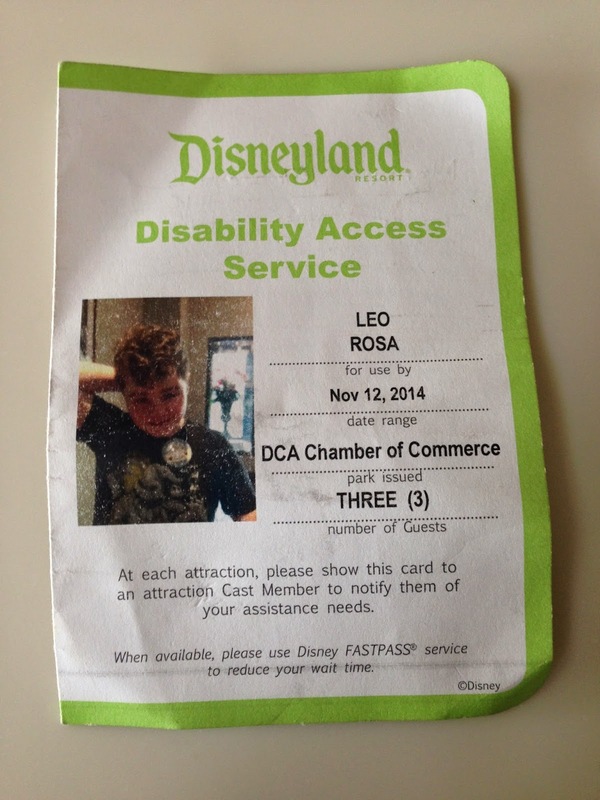 Which means we got to hit the California Adventure Chamber of Commerce and get Leo's Disability Access Pass (DAS) before the park was even officially open. It was great; there was only one other family in line at the Chamber of Commerce when we arrived. Getting the pass was straightforward. 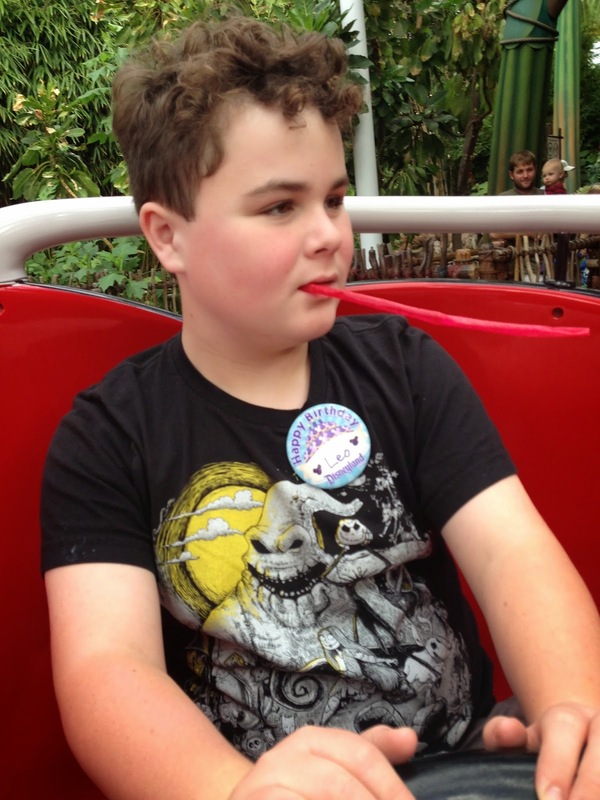 They asked me why Leo needed the pass, and over his bouncing and giggling because OMFG Disneyland, I told them his disability meant he had trouble waiting in long lines. They said "No problem," took a picture of Leo, and printed the pass out. We didn't even need the DAS during magic hour. As soon as the park rides opened, we walked over to Soarin' Over California (which Leo loves, and calls "helicopter! "), and waited only 10 minutes. Leo was ecstatic. 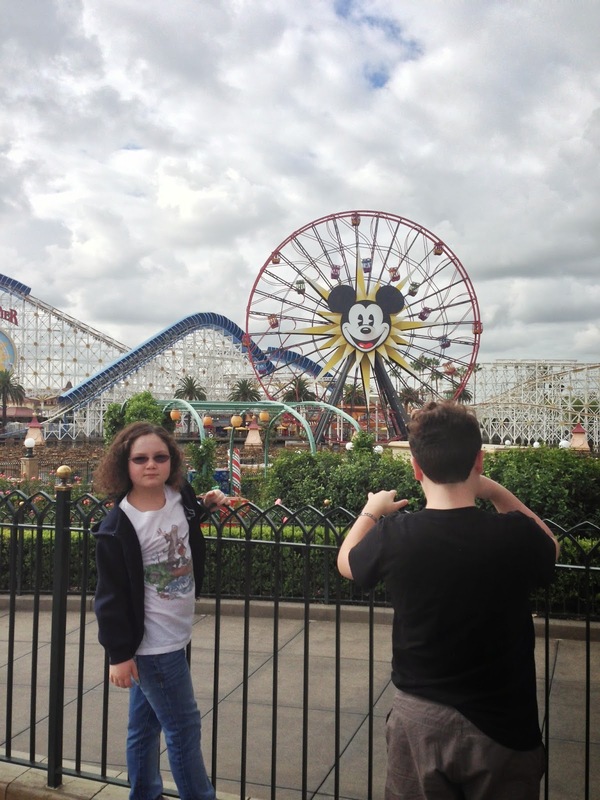 We then walked the nearly empty streets over to the California Screamin' roller coaster, which Leo did not enjoy as much as he remembered, and unfortunately (from roller coaster fan Mali's perspective) did not want to re-ride. There was a bit of sadness over that. Mali was especially disappointed, because as you can see from the California Screamin' sign below, the wait time during Magic Hour was all of five minutes, and she could have gone many many many times in a row. Alas. Compromises smart sometimes, when one is not yet ten. Then the park opened to everyone, and the lines for the popular rides got long, and it was time to use the DAS pass. 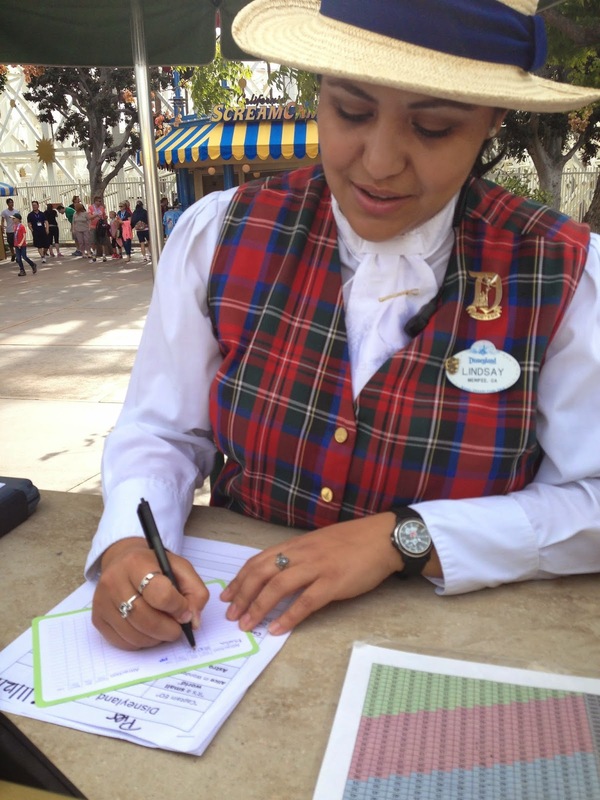 I was nervous, but all the Guest Services cast members administering the DAS pass logistics were friendly and helpful. And using the pass was much less complicated matter than it sounds: go to a kiosk, and tell the person which ride you want to ride (Don't forget to say "please"). 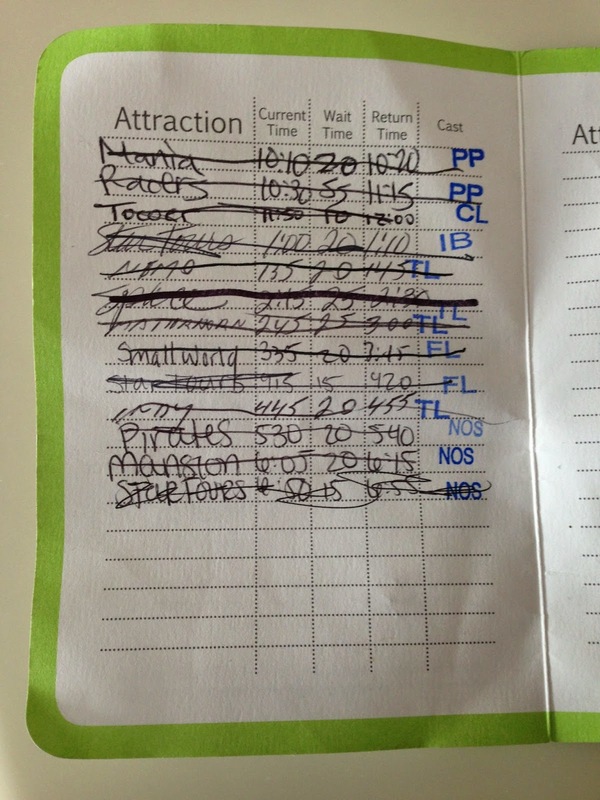 The cast member looks up the current wait time, cuts it in half, and writes down the current time + half wait time as the time you can go on the ride. Then they stamp the ride time with their initials. Honestly, the most stressful part of using the pass was locating the Guest Services kiosks. Once we got to the rides, the pass worked exactly like the previous disability pass did: you go in the accessible or FastPass entrance. Sometimes you have lines, sometimes you don't. 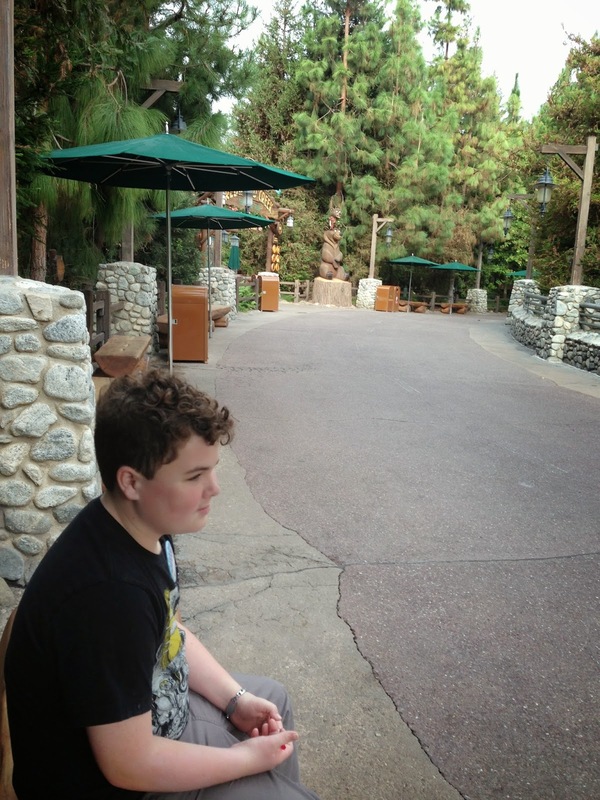 And Leo was fine with any the waiting he had to do, because damn, he was at Disneyland! One caveat: the DAS pass logistics will apparently be changing as of this week, though cast members were not able to reveal much, other than that they all had to go to training. They (and by "they" I do not mean the woman pictured below) did say folks were still finding ways to game the system, by getting multiple passes per family, and splitting up to get multiple times, but then having the whole family use all of those times (as opposed to having two different kids who qualified for the DAS pass and wanted to go on different rides at the same time, which would be fine). Commenters at TPGA also mentioned rumors that people were forging ride times. If you look at the pass above -- handwritten with stamped initials -- I allow how easy that could be for a motivated person to falsify. The only ride we had to wait more than 15 minutes for, even with the DAS pass, was the new Cars ride. Which was absolutely worth the wait. But there was plenty to do while we waited, because it was (say it with me) a low attendance day. So there were plenty of nearby rides that needed no DAS access because the lines were so short. Rides like Leo's beloved twirly ladybugs. In fact, on this low attendance day, most lines were so short that we didn't even need to supplement Leo's DAS pass with Fastpasses, as many folks had recommended. [Image: Leo seated in a spinning lady bug car. We also used our downtime between DAS rides to have snacks, meals, and pit stops. 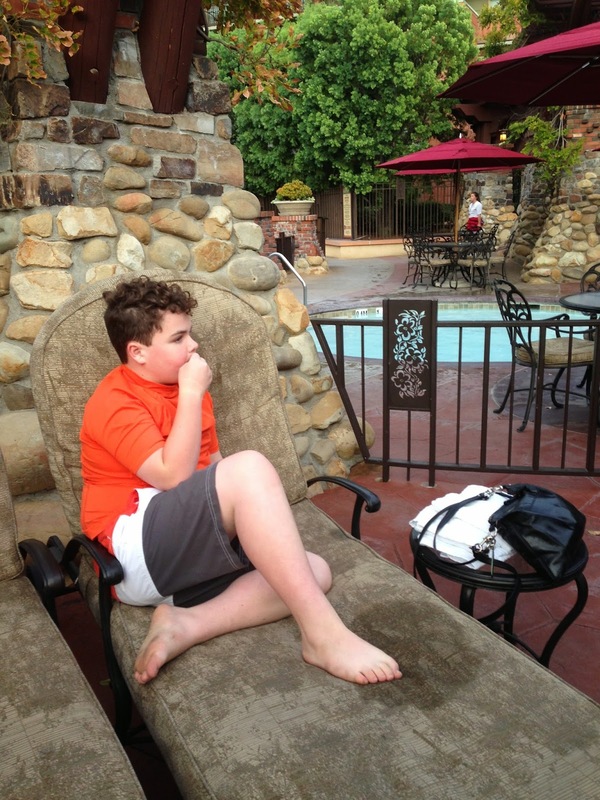 We sat on more than a few benches to chill with iDevices or snacks, or just rest. Walking around all day is tiring! Breaks are good! 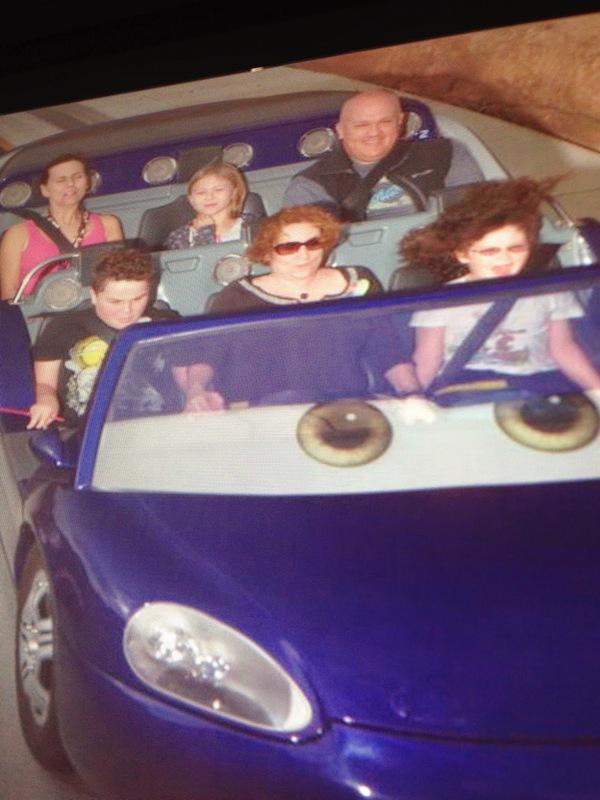 The cars ride, again: totally worth it. I recommend it. Even though we only went once because of the long wait. [Image: Leo, Me, & Mali on the Cars ridecam. One ride we did go on three times was Star Tours. Because it is Leo's favorite ride in the entire galaxy. 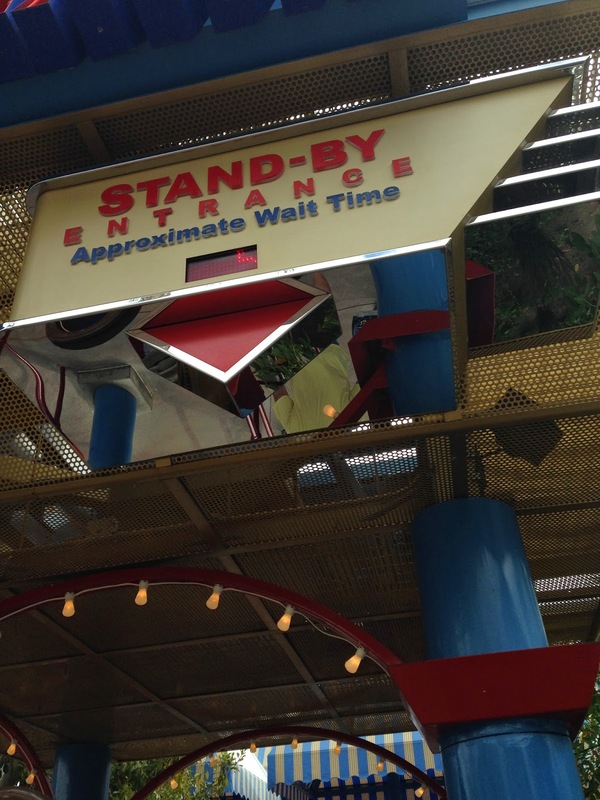 But we did do the DAS wait time every time, and Leo was OK with that because of other rides he liked that had short wait times. Including that ultimate sensory seeker experience, the Spinning Tea Cups. You know what else made our visit great? Everyone was just so nice. This is the aspect of Disneyland that is actually magic, to me -- accommodation is part of the the culture. The cast members ask what they can do to help, take accommodation requests seriously, and we didn't have a single encounter with WTF face. I think we'll be going back next year, and repeating these circumstances as much as we are able**. Not sooner, because the logistics that make these trips work for us are expensive, even with gift cards from Grandma. And going on a low attendance day requires scheduling sleight of hand and will not be possible for everyone, and indeed for us most of the time. But our trip was such a success. We kind of have to go back, because Leo is leaning against me as I type this, giggling at these photos of our trip, and asking, "Disneyland?" *DRtC = Don't Read the Comments. No, seriously, do NOT. **Repeating it minus the doing-it-all-in-44 hours time frame. The wham-bam timing was mostly OK, but a solo seven-hour drive after a full day at a theme park is not something I recommend. TPGA: How did ASAN get involved with the Stapleton case? SC: ASAN generally issues statements after individual incidents of violence that come to our attention, often statements concerning media coverage. But with the Stapleton case, since I’m a lawyer and I started at ASAN one month after the attempt on Issy’s life, we really wanted to see if we could influence the trajectory of the case, not just the media coverage. So, on the recommendation of one of ASAN’s members — we get a lot of good input from our membership — we reached out to the prosecutor on the Stapleton case. We thanked her for taking the case on, and for taking it very seriously, and for really pushing to make sure Issy got justice. And we offered ourselves as a resource to educate the court and the prosecutor’s office about the issue of violence against people with disabilities by caregivers. TPGA: And how was your offer received? Were you able to influence the prosecution, and/or the court? SC: The prosecutor was very friendly and said that our efforts would really help. What we ended up doing was writing a sort of a Sentencing Statement. In criminal cases, at sentencing, there is an opportunity for anyone to submit a statement to the court, on how they feel the judge should sentence the defendant. For example, Issy sister Ainsley sent in a sentencing statement, I believe Issy’s father Matt submitted a sentencing statement, and the prosecution submitted its own statement. And ASAN submitted sort of a third party sentencing statement through the prosecutor’s office. Our statement, which is up on our website, really goes into a court-friendly argument about how the sentencing needed to be treated the same as any other incident of violence. The court was hearing a lot of messages from the defense, from other witnesses, about how Issy’s disability was so stressful that it should be seen as some sort of mitigating factor. That Kelli Stapleton had been suffering for years with Issy, and that she snapped — exactly the same kind of messaging that we often seen in the media. Which is very dangerous. We wanted to make sure that the court understood that stress is involved in almost every incident of serious child abuse, but it should not be seen as a mitigating factor more than any other source of stress should be seen as a mitigating factor. By and large, parents of people with disabilities are able to take care of their children without trying to kill them. And in fact the majority of parents of people with disabilities have less access to services than this mother did. She had gotten her child into a residential placement, there were some issues with her school, but she had been getting a whole lot of help — including securing almost continuous care in the home, a level of support far higher than almost anyone else in the state was receiving. And the court heard from many of Issy’s family members, many of whom contradicted the mother’s description of Issy. They said Issy was fine with other family members and care workers. Kelli tweeted that aides had offered her tips on how to manage Issy’s behaviors in a way that wouldn’t cause meltdowns, and she rejected their advice. And parents sometimes do know their children better than care workers, I’m not saying whose advice was correct. But it certainly wasn’t the case that Kelli Stapleton didn’t have help. The final goal for our witness statement is to just keep the focus on Issy, and make sure the judge understands that the case is about Issy, about something that happened to her. Issy understands enough about what’s going on around her that it’s really going to be very dangerous to her — and to many other people with disabilities — if the court sends the message that we should just expect abuse. That her disability is so severe that she should just expect to be abused by those around her because they are so stressed out. And that’s basically what it would mean if the court were to say that the abuse simply was a natural result of caring for a person with a disability. We kept in touch with the prosecutor, and that really helped us develop our opinion of how the sentencing decision went. The prosecutor, unlike us, was present in the courtroom when the judge announced the verdict, and was able to tell us that the judge was really focused on treating this incident the same way as any other incident of child abuse. The court didn’t really mention anything about Issy’s disability making the woman’s life harder. TPGA: We often have to counter misleading messages about cases like Issy’s, messages implying or stating outright that abuse (or worse) happens because “parents just need more support” — which was certainly not the situation here. What did the court have to say on this matter? SC: The judge did acknowledge that Kelli Stapleton was in need of help — for emotional problems, not in terms of needing help caring for Issy. She was having personal difficulties in the time leading up to the attempted murder. But she wasn’t in need of intervention in managing Issy’s behavior — she was in need of intervention in managing her own behavior. And the judge did take that into account, but very fortunately kept the focus off of Issy, and off of this argument that Issy’s disability was somehow the cause of the mother’s act of abuse. Kelli clearly had a history of responding to stress by lashing out at others, mainly Issy, but she had been making statements about her frustration and clearly terrible relationship with her daughter, for a long time. We don’t take the position that there wasn’t anything that couldn’t have been done. But the intervention that needed to be done was someone noticing that this person was expressing persistent hostility towards her daughter, and noting that maybe that might be a dangerous situation, and intervening. TPGA: Are there interventions that, in your opinion, might have helped? SC: What we need is for social workers and other such officials to be able to try and intervene in cases of violence in families, including in ways that are short of removal. It’s possible that social workers weren’t observing anything in the Stapleton case that in itself merited removal, but should have been ringing warning bells. They could have started intervening in less dramatic ways — started by offering counseling to the parents, and respite services, depending on what is available in Michigan. But people needed to be aware that this was an at-risk family because of Kelli's attitude towards Issy. TPGA: Were there any indications as to how Issy is doing? SC: Issy was in a coma for days. She has permanent traumatic brain damage. The brain damage very luckily has not affected her communication skills, but she has mobility and coordination problems that are greater than what she had before. And she’s going to have to live the rest of her life knowing that her mother tried to kill her. We have members of ASAN whom I know personally, whose parents tried to kill them, or who acted extremely violently towards them. Fortunately that’s not an experience I had personally, but being able to hear people talk about what that was like for them is an important part of developing awareness that acts like this have real consequences. TPGA: Was ASAN satisfied by Kelli’s sentence of 10 to 22 years? SC: A lot of people were calling for life in prison, and I certainly wouldn’t have objected; I feel like if any act deserves life in prison, attempting to murder your child would be one of those things. The reason we believe Kelli Stapleton’s sentence is a significant penalty, and not a slap on the wrist, is that the sentence is in line with those we would typically see for a similar crime, for other people in that same situation but where disability wasn’t a factor. It is never acceptable to hold a child’s life hostage in the demand for more services. There are many things that we as a society can do to prevent these kinds of acts of violence. But those things need to be focused on preventing abuse, communicating that every person’s life is valuable, and detecting the warning signs of possible violence ahead of time, and really providing targeted anti-violence services rather than simply giving the parents more support in whatever therapy they want for their child and hoping that that will somehow improve the parent-child relationship. If the parent is so antagonistic toward their child that they’re contemplating violence, then something needs to change and it’s not the child — it’s the parent. This is really the first time ASAN has been directly involved in the advocacy around a particular prosecution. We’ve been challenging media narratives, we’ve been blogging, we’ve been issuing our own statements — but now we’re really coming into our own. We’re really able to participate in the actual process, and influence the people who are making important decisions about sentencing, about the kinds of services that need to be given, about the kinds of defenses that are acceptable, and about the kinds of defenses that are going to be recognized as straightforwardly anti-disability. We’re really, for the first time, able to have a direct impact on that.